From the Star Wars collection by Fanwraps. 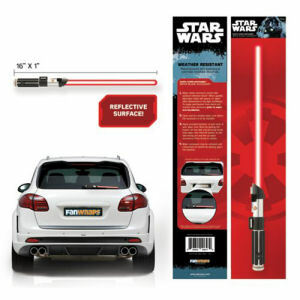 Star Wars Darth Vader Lightsaber Wiper Blade Accessory. Each blades measure 16 inches long by 1 inch wide and includes 3 Dual-Lock Straps. These are made to fit over your existing windshield wiper blade assembly. Does not include actual wiper blade assembly.